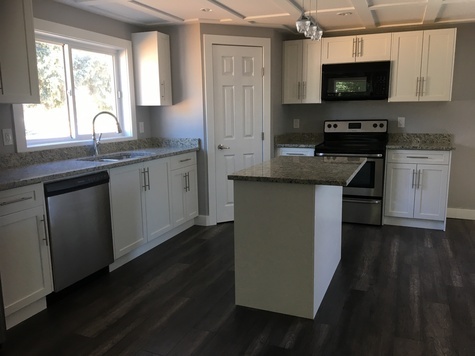 Beautiful fully renovated 11/2 story home with a full basement suite with private entry for a great revenue opportunity to pay down that mortgage! This really is a new home with the house having all new electrical, plumbing, insulation, new concrete floor in basement, windows, 2 furnaces, water heater, drywall, shingles, siding, central air, deck and up to date decor. Main floor: 1400 sq. ft. Walk into a large foyer with a walk in closet. Open concept design from the living area and kitchen and dining area. Kitchen has beautiful white cupboards with granite counter tops and stainless steel appliances, pantry and island. Three bedrooms, Master bedroom having a walk in closet and large bathroom with double sinks. Walk out onto a large deck from your dining area overlooking a large yard. Basement suite: 1000 sq. ft. with large ground level windows. Kitchen has beautiful white cupboards and granite counter tops. Large living room and dining area. There are 2 bedrooms. Bathroom also has a granite counter top, there is also a large laundry room. For more information or a viewing please call or text 306-741-9807.